Here we have an online reel that mixes a Japanese anime with a spontaneous female cat. There’s a mega 1296 ways to win in this contemporary east-Asian slot game. In fact, this game breaks down the long held boundaries that a slot game should only have 5 reels, this one has 8! 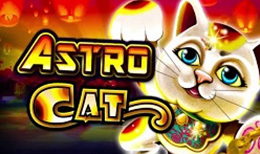 Match up an array of symbols including; jumping carp, fireworks, and dancing cat wilds to earn your fortune, today. soundtrack but we find it’s best for you to discover that on your own, lets just leave it at that. also an auto-play feature which will play the game for as long as you desire.